December has been the kind of month that gives a person whiplash. I’ve had school work to do with the kids, photo shooting to help out with at the farm, 3 days of awful sickness, a cookie party to clean and plan for, and decorating to do. THIS week, however, all of that is behind me. All of the shopping is done, picture – taking and posing are done, partying with my book club and friends accomplished. Therefore, starting today – Monday – I am giving myself a completely unnecessary challenge; bake one kind of cookie every day until Christmas. This is the kind of challenge that should result in a wide variety of cookies for us to enjoy all week with a less hectic kitchen. It’s also the kind of plan that, once Paul gets wind of it, will create in him an almost manic glee resulting most likely in an impatient expectancy for each new batch. 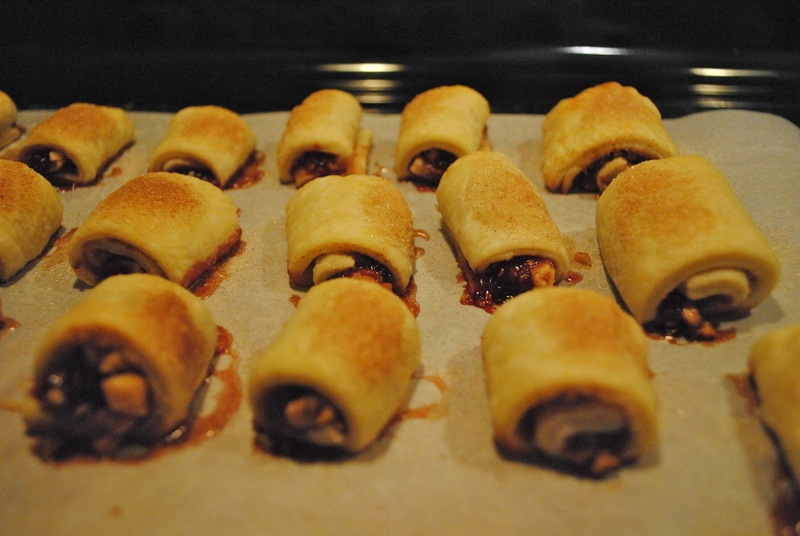 Today’s batch is complete: Rugelach! These are maybe our favorite holiday cookie. Last year I posted the recipe and you can find it here. Stay tuned for tomorrow’s cookie: Gingerbread cut-outs! This entry was posted in Uncategorized and tagged food, Seasons. Bookmark the permalink. If you continue to come up with these amazing ideas, you will have to move closer to me! In the mean time, however, thanks for sharing the recipes. This will also mean I am going to need to clean up my kitchen so I can bake, too. Shirra, I ALWAYS wish we lived closer!!!!!!! Awwwww man. I thought it was going to be EAT a different cookie every day. That I could do.